Set in London, 1865, Finch seems to capture a kind of 21st century idea of the place and time with historical accuracy and without any anachronisms – (that I noticed). 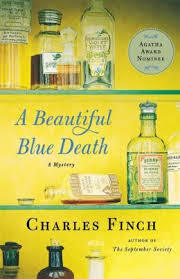 The protagonist, Charles Lennox, is a rich bachelor of the amateur variety – solving these little mysteries is a hobby. This is the first in a series so the main characters are possibly more thoroughly developed than in a standalone. So now the ex-housemaid of Lady Jane Grey, Lennox’s his long time friend, has been found dead in the home of her new employer, George Barnard. It’s agreed the cause of death was probably of poison but whether or not it was by her own hand or that of another is the first dispute. Fwiw, poison was a common method of murder until the development of forensics regarding it in the 19th century. (See – The Poisoner’s Handbook by Deborah Blum) The fingerprinting and forensics information is correct, but the rare expensive poison, Bella Indigo is fictitious. Many interesting clues after the fact of murder is established – type of poison, open window, “suicide” note – (no spoilers). Everything is made clear at the end.